Front elevation of the circa-1843 William Gatewood House, which features design elements of the Greek and classical revivals. “To achieve symmetry on the front elevation, the south side piazza is ‘masked’ by a brick wall—complete with windows—which hides the open bay piazza,” says Winslow Hastie, director of preservation and museums, Historic Charleston Foundation. “This rare treatment,” he adds, “is found on only a small number of residences in Charleston. The grand piano nobile level is marked on the exterior by elaborate marble window architraves with marble panels beneath.” The unified appearance of the façade is due in part to the mortar being tinted to match the brick. Photography by Paul Costello; Image courtesy G.P. Schafer Architect. Advertised as a “rare opportunity” nearly one hundred and fifty years ago, this was exactly what the present owners felt about the circa-1843 William C. Gatewood House, one of a handful of grand Greek Revival houses in Charleston, South Carolina, that has retained its original historic interior without significant modifications. For six years the couple expressed interest in purchasing the residence, but the reluctant owners were not ready to sell. Finally, the husband wrote a letter reassuring the owners that they appreciated the integrity of the house and their intentions were to restore and preserve it. Another two years passed before the couple received a call notifying them that the house could be theirs. William C. Gatewood was a merchant from Virginia, who apparently wanted to display his wealth to his new Charleston neighbors through the building of a grand home. The architect thought to have overseen and designed the house was Edward Brickell White (1806–1882). Perhaps the most prolific and talented commercial architect in Charleston from the 1820s through the Civil War, his projects included a number of churches and public buildings, including the famous Huguenot Church (1844) and Market Hall (1841). The 1843 Gatewood House was one of the few residential homes in which he was involved;1 the 1838 Robert William Roper House along the Battery may also have been his work. 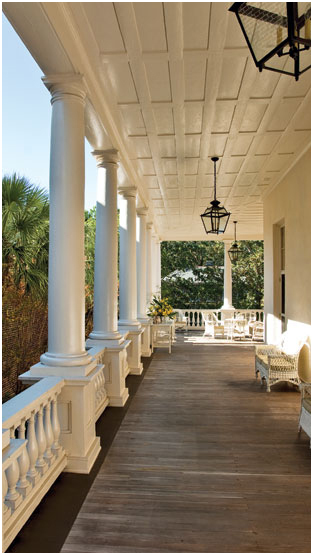 ABOVE, CLOCKWISE FROM LEFT: The piazza, with its Tuscan columns and turned balusters, epitomizes the grand Charleston home. There is a similar piazza above and an arched colonnade runs the length of the ground floor. When the house was built, the piazzas faced south toward a view of the Ashley River, which is now obscured by other structures. The couple frequently entertains on this main piazza, using their period Heyward-Wakefield wicker furniture. Photography by Rick McKee. The arcaded lower-level piazza is visible through a window in the library on the ground floor. 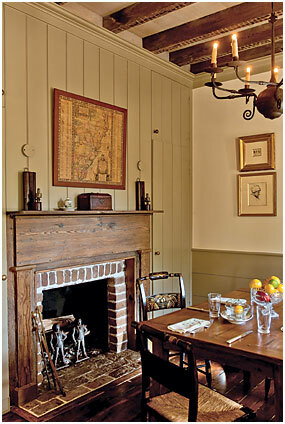 The mantel is one of the few new architectural elements, the original having been lost. Photography by Paul Costello; Image courtesy G.P. Schafer Architect. The piazza on the main house looks over the back gardens and reflecting pool to the kitchen ell and—behind the trees—the carriage house, which the couple just recently acquired and plan to turn into guest quarters. Photography by Rick McKee. In addition to its important history, what the couple found so appealing about the house was its intact architectural integrity. Though portions of the original two-story rear kitchen house had been divided into apartments and boarding rooms in the mid-twentieth century, the original interior detailing and essential fabric of the three-and-a-half story main house had been retained. The one glaring challenge was the fact that the house had received very little maintenance through the decades, even after the earthquake that wreaked havoc on much of Charleston in 1886. The wife, an ardent preservationist, was undaunted. She had already restored several properties and so understood what was involved—if one could ever be said to be fully prepared for such a daunting undertaking. 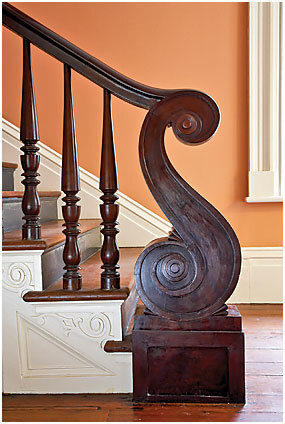 LEFT TO RIGHT: This elaborate newel post forms the stairway that ascends to the formal rooms, typically located on the second floor of the finer houses in Charleston. Photography by Paul Costello; Image courtesy G.P. Schafer Architect. The classical carved mahogany card table is one of several in the collection made in New York and was purchased from Russel Buskirk. Photography by Rick McKee. LEFT TO RIGHT: A view from the main hall looking toward the exposed brick wall of the original kitchen house. 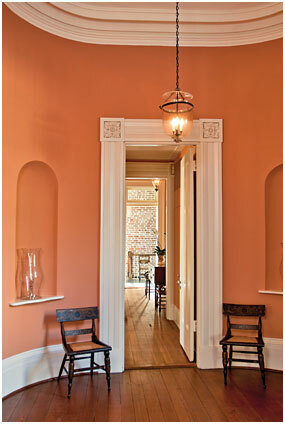 Two Baltimore or Philadelphia fancy painted side chairs flank the doorway. Photography by Rick McKee. The hallway of the first floor encompasses an entire bay, illustrating the spacious floor plan of this grand single residence. 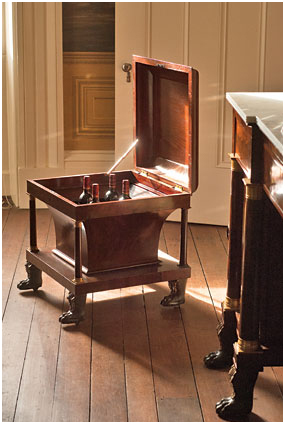 The classical server, purchased from Carswell Rush Berlin in Manhattan, is of a rare large size, and is attributed to the New York firm of Holmes and Haines (active 1825–1828). The stenciled and gilded decoration is original. The carved circa-1825 giltwood looking glass is inscribed “Silsbee, 183 Beacon Street, Boston” on the back. The gilt bronze double-argand lamps, purchased from Hirschl & Adler Galleries, New York, are attributed to Messenger & Sons, London and Birmingham, England, circa 1827–1830, and retailed by Baldwin Gardiner (active 1827–1847), New York. The marble statue is the Venus de' Medici. Photography by Rick McKee. 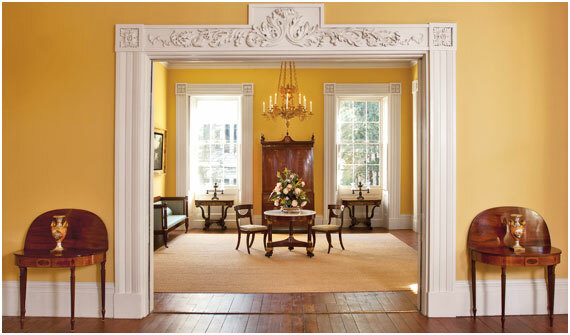 ABOVE, CLOCKWISE FROM TOP LEFT: The Charleston sideboard is one of the few pieces of Federal furniture that the couple retained—its diminutive size is perfect for the back hall. 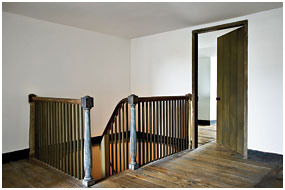 During restoration, it was discovered that a service stairway had been located in this space, and a stairway, in the nineteenth-century hyphen between the main house and kitchen house, had led from the main floor to the ground level. Both had been covered by previous owners. Because the original material had been altered, the present owners allowed the architect and contractor to expose the latter stairway (seen against the brick wall of the kitchen house) and create a new service stairway in the back hall. They also added an elevator, just out of sight of this image. Photography by Rick McKee. The front stairs are embellished with the original carved returns. Photography by Paul Costello; Image courtesy G.P. Schafer Architect. The double parlor retains the original 1843 woodwork and plaster elements, as well as the original mantels and triple-hung windows. The integrity of the original material on the main floor is a rare survival and one of the most appealing factors for the owners. Paint analysis provided very little original evidence because of the numerous decorative campaigns through the years. 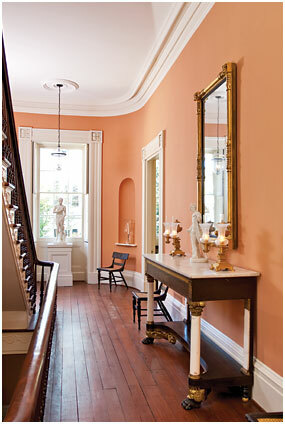 The wooden elements and trim retained some original off-white tones, which have been re-created. The pair of circa-1805–1815 satinwood card tables are attributed to one of the leading cabinet shops of Federal-era Charleston. 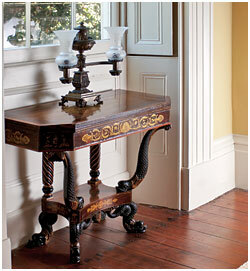 Other furniture forms from this shop are in the collections of Colonial Williamsburg and the Garvan Collection at Yale. Photography by Rick McKee. The front parlor contains some recent acquisitions, including the chandelier, one of a pair; a classical New York box sofa attributed to Duncan Phyfe (1768–1854), with a provenance in the Drayton family of Charleston, and likely originally made for the family; and one of only four known center tables attributed to Deming and Bulkley (active 1820–1850), one of the most prominent New York firms of the classical era. The table was likely retailed through their shop on King Street, Charleston, then the most important supplier of fashionable furniture in the city. All of these objects were purchased from Carswell Rush Berlin. The Charleston linen press descended in a the Seabrook family and features inlaid ovals, bellflowers, stringing, and design elements consistent with locally made furniture. It was purchased from Jim and Harriet Pratt. 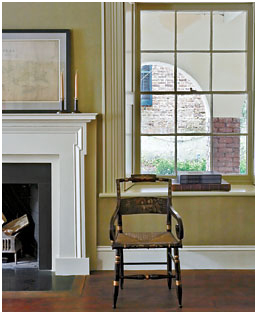 The classical chairs, circa 1815, were made in New York and are from the J. Welles Henderson estate. Photography by Rick McKee. Because of their interest in retaining as much of the original material as possible, the couple sought out the kind of architect and contractor who would be sensitive to such issues. Years earlier the wife had taken one of former Charlestonian Tom Savage’s famous study trips abroad (a joint session with Sotheby’s Institute of Art, New York, of which he was then director, and the Institute of Classical Architecture), where she met Gil Schafer, whose Manhattan firm, G.P. 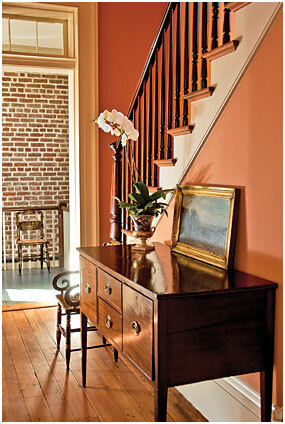 Schafer Architect, specializes in working with clients whose homes are period or have an historic feel. When the couple purchased the Gatewood House, the wife knew who to call. Locating a contractor was equally straightforward. 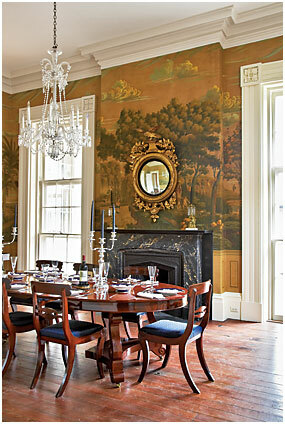 Charleston is fortunate in its abundance of preservation-minded citizens, and Richard Marks, of Richard Marks Restoration, Inc., had already worked on a number of historic residences on the same street. The main team assembled, they embarked on a project that would take four years to complete. The first step the couple took was to temporarily move into the house to familiarize themselves with the layout and determine, with the help of the architect, how they would use the house once the restoration was complete. Some decisions arrived at, they returned home to the Heyward Lynah House, which the husband, an eleventh-generation Charlestonian, had inherited before the couple was married; it was here they remained until the Gatewood House was ready. 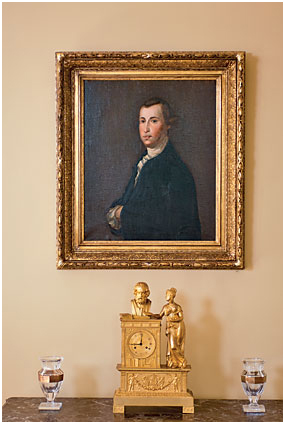 LEFT TO RIGHT: Hanging in the back parlor is this portrait of Thomas Heyward Jr. (1746–1809), signer of the Declaration of Independence and an ancestor of the husband, who is an eleventh-generation Charlestonian. The French Bronze Dore mantel clock depicts Homer. 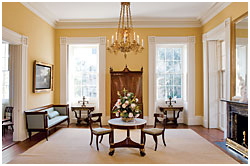 Set between the two window bays in the front parlor is a pair of classical, circa-1820–1825 gilt-stenciled dolphin card tables with provenance in a Charleston family and attributed to the New York firm of Deming and Bulkley (active 1820–1850). The double-argand lamps are in untouched condition and, unlike most examples, are not wired. They are attributed to Messenger & Sons, London and Birmingham, England, circa 1827–1830, and retailed by Baldwin Gardiner (active 1827–1847), New York. The windows retain their original interior shutters. Photography by Rick McKee. The flexibility in the restoration lay with the areas that had been previously altered––the back hallway, a nineteenth-century hyphen between the main front building and the back kitchen house, and the latter structure. 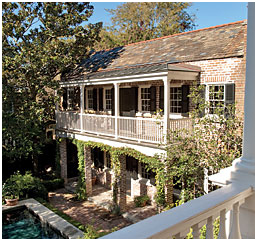 Within these areas, architect Gil Schafer created spaces that blended seamlessly with the original historic framework. 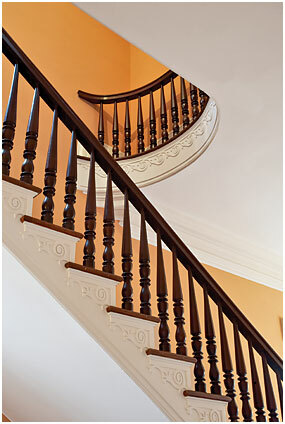 Working with Marks to recreate staircases that had been removed, Schafer created flow patterns that unified the informal and formal environments, allowing for easy circulation throughout the house, gardens, and piazzas, an important factor since the couple regularly hosts charity events for preservation groups and arts organizations; welcoming upwards of three hundred guests. LEFT TO RIGHT: The dining room is papered in a hand-painted reproduction scenic de Gournay paper depicting Sauvages De La Mer Pacifique. 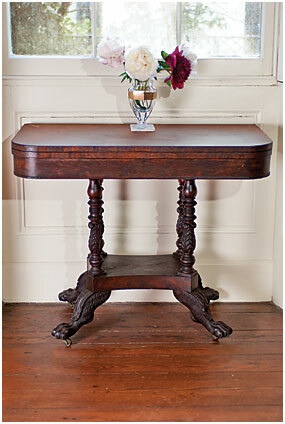 The classical extension dining table is from Boston, circa 1830, and was purchased from Hirschl & Adler. The set of Klismos chairs are New York of the same period. The husband inherited the gilded girandole mirror, circa 1825–1830, from his great grandfather Arthur Lynah. The triple-hung windows open for access to the piazza. Photography by Paul Costello; Image courtesy G.P. Schafer Architect. The classical bronze-mounted mahogany marble-top sideboard with matching cellaret was purchased from Carswell Rush Berlin, and is attributed to either Joseph Brauwers or Duncan Phyfe, both of New York, circa 1815–1820. An identical sideboard attributed to Phyfe, but with silvered mounts, is in The Metropolitan Museum of Art; the museum example lacks its cellaret. 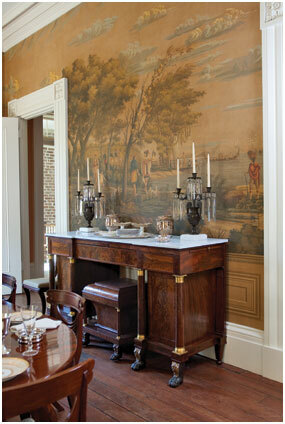 A related sideboard is in the Telfair Museum, Savannah, Georgia. There are also related examples in private collections, but labeled by Brauwers, raising the possibility that both craftsmen were making the form. Photography by Rick McKee. 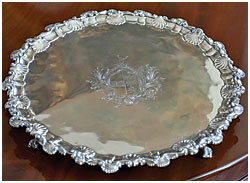 This silver salver is of magnificent proportions and has applied rococo shells within an undulating border. The center is engraved with an ornate cartouche bearing the arms of Branford impaling Savage. Stamped by London silversmith Ebenezer Coker, it is dated to 1765–1766. The salver descended in the Charleston family of William Branford and his wife Elizabeth Savage until purchased by the current owners. Photography by Rick McKee. The restoration completed, the owners began working on furnishing the house. The wife was already a collector, but primarily of Southern Federal-era furniture, which was generally too small in scale for the formal rooms of the Greek and classical revival interiors of the Gatewood House. She began visiting antiques dealers who specialized in the appropriate material, among them, local dealers Jim and Harriet Pratt (now retired), New York dealers Stuart Feld of Hirschl & Adler and Carswell Rush Berlin, Charles and Rebekah Clark in Woodbury, Connecticut, and Sumpter Priddy in Alexandria, Virginia. In working with these and other knowledgeable sources, she and her husband have focused on acquiring furniture of the classical period from the major style centers of New York, Boston, Philadelphia, and Charleston (of which they have a number of labeled pieces). The cabinet shop in which most of their finer pieces were made was that of the New York firm of Deming & Bulkley (active 1820–1850), which operated a local shop on King Street in Charleston. Only just beginning to fill the capacious rooms, she and her husband will be collecting for a while to come. LEFT TO RIGHT: Matching cellaret to the New York sideboard in the dining room. Photography by Rick McKee. 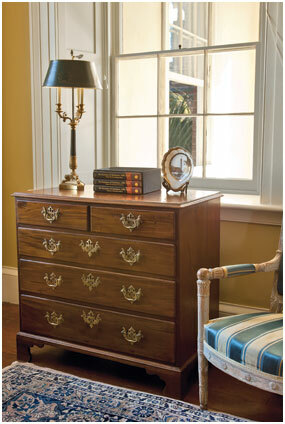 LEFT TO RIGHT: The chest-of-drawers was made in Charleston and is dated February 24, 1766. Visible through the window is the street end of the piazza brick wall and window, which, from the street, give the appearance of a symmetrical façade. The kitchen hyphen was added in the nineteenth century to attach the main house to the kitchen house. The wall to the latter had been closed up and a kitchen put into this space. 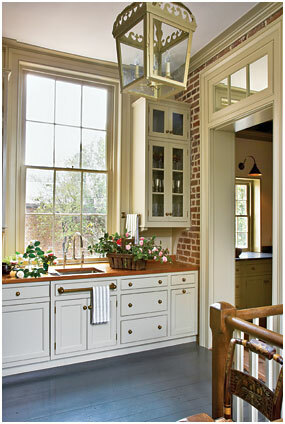 Architect Gil Schafer tore out the kitchen and replaced it with a pantry, reopened the wall and gave the hyphen the feeling of a porch, with exposed brick, a tongue and groove ceiling, and shutters on the opposite wall leading back into the main house. Photography by Paul Costello; Image courtesy G.P. Schafer Architect. LEFT TO RIGHT: In the mid-twentieth century stairs to the fourth floor were removed and the area at the bottom was turned into a washroom. 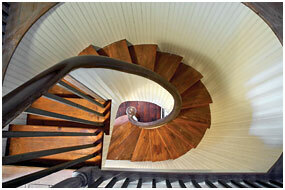 Richard Marks, the restoration contractor, discovered “ghost” marks of where a steep stairway had been. To make access safer, he designed a spiral staircase to fit the space. Photography by Paul Costello; Image courtesy G.P. Schafer Architect. Access to the fourth floor, originally the slave quarters, had been cut off for eighty years when the owners purchased the house. As a result, all of the original floors, baseboard, doors, and plaster survive and date to the original period of the house, even retaining their original paint and untreated surfaces. 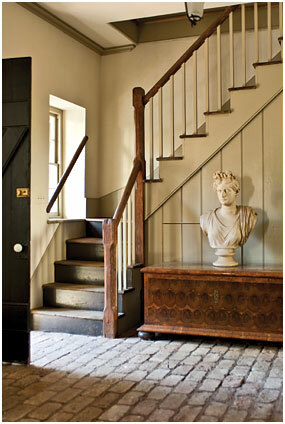 Though the original railing and stairway had been removed, Richard Marks found a newel post and stair banister and recreated what was originally there. Gil Schafer added a working bathroom to one of the spaces. Photography by Paul Costello; Image courtesy G.P. Schafer Architect. In line with the couple’s interest in preservation, they recently purchased the original carriage house that runs along the back of the lot and which had been sold by the previous owners in 1959. This acquisition reunites the original plot of land and the main structures on the site. Asked about their plans for the carriage building, the wife says they intend to convert it to a guesthouse, though given the project they have only just completed, she notes they are in no great hurry. 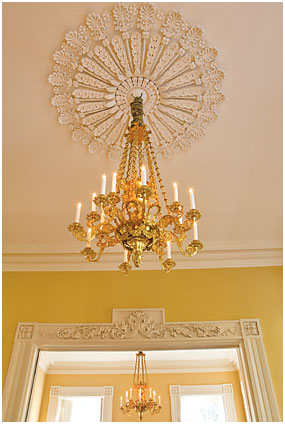 The owners of the William C. Gatewood House worked with Historic Charleston Foundation to put an easement on both the exterior and portions of the interior, which include original decorative elements such as hardwood floors, plaster cornice molding, window and door surrounds, marble mantels, and plaster ceiling medallions. Unfortunately, these important interior finishes are often removed by owners who do not understand their significance, and interior easements are the only way to ensure protection of these spaces in perpetuity. 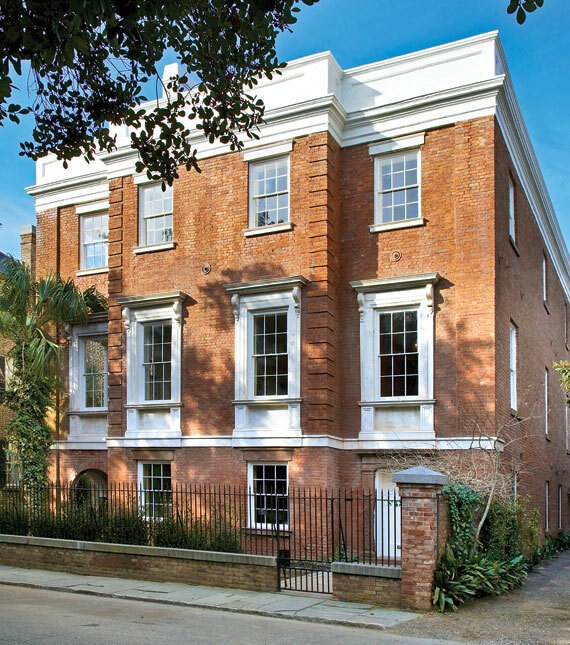 Accordingly, Historic Charleston Foundation has focused in recent years on promoting interior easements and educating property owners on the irreplaceable value of these historic features. 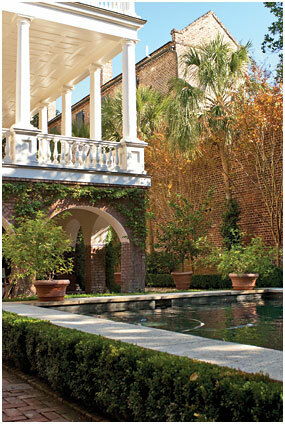 12 Vanderhorst Street, Suite D, Charleston, S.C.
1. According to Richard Marks of Richard Marks Restoration, Inc., Charleston, the architectural conservator involved with restoring the property.